Can anything stay a secret these days? It wasn't too long ago that the gaming world was wondering whether Sony would finally change its iconic PlayStation controller for its next console, the PS4, and now it appears we already have a pretty solid idea of what the PlayStation 4 controller looks like. 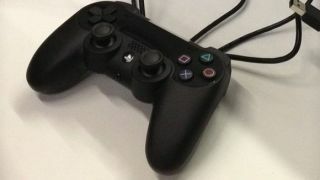 A photo leaked on Friday that purports to show a prototype of the PS4 controller followed one leaked on Thursday, showing the same device. The new image's origin is unclear, but it appears to match the previous one. The controllers pictured feature a touch trackpad in the center, consistent with rumors that have been flying for the past two weeks. Sony's DualShock PlayStation controller has remained largely unchanged since the second stick was added in the late 1990s. The PlayStation 2 and PlayStation 3 controllers were nearly identical to the original PlayStation controller, besides some small tweaks. However, based on the PS4 leaks that appeared this week, it seems that's finally about to change. Rumors of a PS4 controller touchpad similar to the PS Vita's rear panel first appeared at the start of February, and it wasn't long before that report was seemingly confirmed by the first leaked image. Speculation contends that the pictured touchpad could even be an LCD screen that could display buttons, media playback controls or other information directly from games. If it's true, the PS4 controller's touch trackpad/display will mark a huge departure for Sony's console. Touch controls have become the norm for gaming, though, with every system from Nintendo's 3DS and Wii U to Microsoft's Xbox 360, with its barely there Xbox SmartGlass features, having touch interactions of some variety. But that's not the only change these images show; the directional buttons look thicker, and the control sticks are concave, with what appears to be a speaker in between them. The start and select buttons are barely visible to either side of the touchpad, as well. Even stranger is the light-colored strip situated on the PS4 controller's top, between the triggers. In Thursday's leaked photo, that strip was glowing blue, indicating that it could have something to do with PS Move-like features for the PS4. Compared with Thursday's leak, the controller that appeared in a photo on Friday has longer handles and what looks like a 3.5mm headphone jack on the bottom, proof that if these are real, they're definitely prototypes that are subject to change. Whatever form the final PlayStation 4 controller takes, TechRadar will be there to cover it on Feb. 20, when the new Sony console will likely be announced.